Warner Bros. Records artist Charlie Worsham drew a packed house in Nashville during the third installment of Pickin’ On The Patio 2014 Wednesday (July 23). The event lived up to its name as Worsham offered a slew of songs from his album Rubberband. The Mississippi native also included a medley of Beatles hits in his set. Gigi’s Cupcakes, Aramark, Ajax Turner, Bud Light, and Patron were sponsors for the occasion. Pickin’ On The Patio is held on the WMN patio the fourth Wednesday of every month from May through September. Mark your calendars for the next Pickin’ On The Patio to be held on Aug. 27. 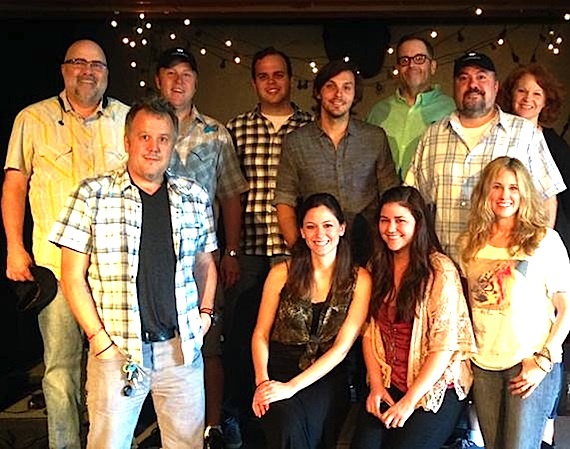 Pictured (L-R): Kevin Herring (Sr. VP, Promotion), Tom Martens (Dir., National Promotion), Mark Noel (Artist Management Partners), Charlie Worsham, Brad Henderson (Big Howdy), Chris Palmer (VP, Promotion) Lisa Ray (VP, Brand Management), Scott Kernahan (Artist Management Partners), Anna Cage (Midwest/Northeast Regional Promotion Manager), Jessica Rouse (Promotion Coordinator), Cris Lacy (VP, A&R). Sarah Darling is adding a new role to her already diverse resume: fashion designer. The singer-songwriter and longtime Durango brand ambassador has designed a collection of western fashion boots for the brand. Two distinct styles, designed by Darling, will be added to Durango’s “Crush” line of footwear. The Sunflower Slouch boot in Sandy Brown is an easy-to-wear boot with a 2 ¼” heel and cushion-flex insole. The Darling Coral boot is tall classic western boot. The 14” shaft features bright coral-colored accents on brown leather and a 2 ¼” heel. Both styles designs are currently available for pre-order at www.durangoboots.com/darling. The Cadillac Three brought their party to the Grand Ole Opry recently, where they celebrated their debut on the venue’s historic stage. The Nashville trio’s Jaren Johnston, Kelby Ray and Neil Mason performed their debut single, “The South,” as well as “Party Like You” and “White Lightning” from their upcoming Big Machine Records debut project. All three band members had family present for the occasion, including Jaren’s father Jerry Johnston, who is a former drummer for The Grand Ole Opry band. 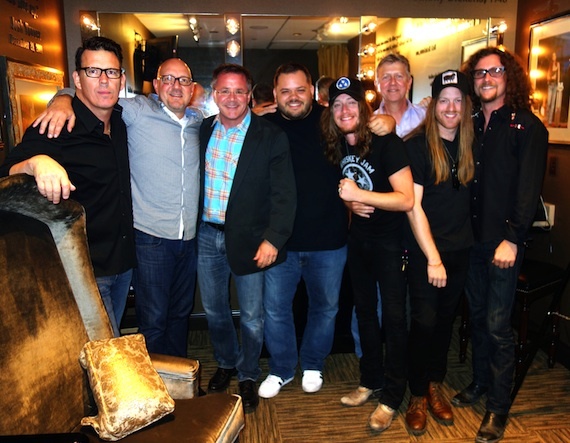 Pictured (L-R): Big Machine Records’ Erik Powell, Jack Purcell, The Opry’s Pete Fisher, WSIX’s Michael Bryan, The Cadillac Three’s Jaren Johnston, Jaren’s father Jerry Johnston, Neil Mason and Kelby Ray. 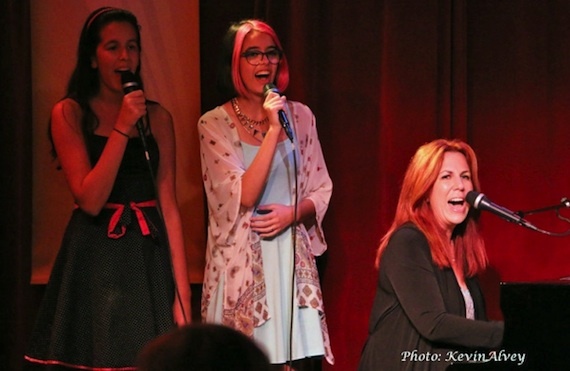 Monday (July 21), songwriter and artist Victoria Shaw celebrated the 15th edition of ‘Victoria Shaw: Under the Covers’. A show, held at Broadway at Birdland, featured Erich Bergen (from the Jersey Boys movie), Desmond Child, James Dean Hicks, and Ramin Karimloo (a Tony nominee from Les Miserables). Guitarist/singer Sergio Ortega offered instrumental music, while Shaw’s two daughters, Ava and Ruby, sang backup for their mother on one song. Victoria Shaw (on piano). Photo: Kevin Alvey.